Having a Managed IT System ensures that one of the most important tools within the business just keeps working. This directly links to increased employee productivity and improved company revenue. It’s also a fact that the performance and vulnerability of many IT systems remain in the hands of one person, qualified or not and if using a third party the service is often not up to the level required. We are continually told by business owners and executives that IT systems cause ongoing frustration and unwanted expense. Smaller to mid-sized companies often have the need but not the budget for a full time IT person and larger companies find their IT people are reactive to problems rather than being proactive. Tech Precision’s Account Management naturally leads to a continual improvement. 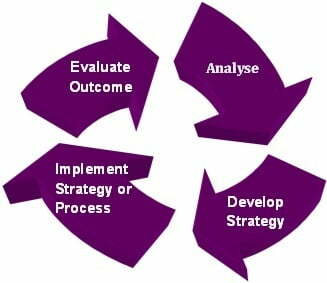 This process is based on clear communication leading to joint solution development and implementation. The evaluation of these solutions with real data provided by Tech-Precision’s reporting system gauges the effectiveness of the implemented strategies or processes. We provide you access to some of the best engineers in the business via on-site and remote services. Our response time is exceptional: we guarantee to have an engineer working on your issue between 15-60 minutes. Bottom line – we understand you’re not in business to worry about IT systems so we provide peace of mind by allowing you to get on with your core business. What do our clients say? View Client Experences.